I'm feeling seriously blue about my blogging. Not only have I not reviewed more than half of my 2016 reads, but it appears I've only reviewed a quarter of my favorite reads for last year. Most of the books I enjoyed the most I've just ... left un-squee'd. I started doing a brisk summary of all my unreviewed 2016 reads but that list got so long, I was immediately daunted. So then I tried to just do two sentence reviews of my top ten of 2016, and even that felt like too much. When did I become so damn delicate? I'm not ready to quit blogging but clearly I need to do something different. I will confess to a sense of overwhelm when I look at all the things I want to do -- read, blog, work on my novel, knit, spend time with my wife and son -- against the free time I have. I could probably be more efficient with my time, but that daunts me as well. So I'm a bit stuck, trying to work through the haze of last year to come up with some plan that keeps me blogging, reading, and being happy. 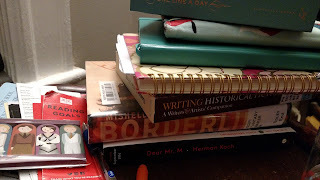 My current side table, which is my unofficial blog life HQ, is mostly cleared of reads; we hosted a big party for New Year's Eve, and I decided not to stack all my I-should-read-these books back. Of the three books I did return there, I've not started any; I'm still stuck trying to finish my 2016 reads, le sigh. Anyway, I don't really have anything to say, other than aspiring once again to do more. My work and social circles have jumped on this year-in-a-word-rather-than-a-resolution trend, which frankly works for me because a list of should-dos is a guaranteed way to get me back into a pit. I've finally hit upon "complete" for my word -- because I want to feel complete, and because I want to complete things. So, what's your 2017 like so far? Any and all tips, life suggestions, and advice warmly welcomed. Let me know what you're reading, too. Yeah, I'm a news junkie *and* do politics professionally so it's impossible for me to shake things -- and it really does impact my ability to relax and read, le sigh. Are you a GoodReads-er? Perhaps we can swap escapist reads there should we come across them...? This is exactly what I'm dealing with. The last six months, I have barely blogged at all and haven't reviewed the majority of what I read last year. I think I'm going to try to write in a reading journal for a while and see if that motivates me to blog again. I also let myself share more personal things on my blog than I have in the past and I enjoyed the writing opportunity that gave me. This year is likely to be a lot of the same. Life seems more important than blogging and we have many changes coming this year, especially professionally. I haven't ever chosen a word for the year, but sometimes I think that could be a good thing. That was me in 2015 -- I could barely make myself read! Like you, I found relief this past year by passing on most blog tours, but I still regret not sharing the love for the books I did enjoy. I have to say, I always love it when other folks share personal stuff, and when I do (like this post), it seems to create connection -- perhaps that's more of what I need to focus on. And figure out how to track/talk about my reading. Maybe it's less public, or in another forum? Or maybe I just return to a paper book journal? I think a lot of us know what you are going through and understand. I took a nice break from blogging and then came back to it late last year. But I don't think I am going to be as regular about it as I always used to be. I too missed reviewing a lot of books I enjoyed. Going forward, I think I am just not going to review every book. I agree, it is exhausting and daunting and it doesn't always feel like it makes a big difference. I have a suggestion, at least for year 2016 reads. Why not make a list of all the books you have not had a chance to review? Then maybe somebody will see a book they have read and review it for you. I would do that. Give it a try. What do you have to lose? that's a great idea! I'll put out the list and see what jumps! I feel you! I've still been reading a lot but actually sitting down and writing a review has often felt like a chore recently. I feel like I want to find a way to be a little more interactive on my blog and hopefully that will make it still feel fun for me! What if you set a reasonable limit. Say, a book a month?